Zoom Launched by Samsung it has new built-in app called Zoom Ring you can use zoom ring while calling and send picture without hangup your calls. Zoom ring has many options like In-Call Photo share, Quick Launch and Short-cut, Optimal Zoom Control. 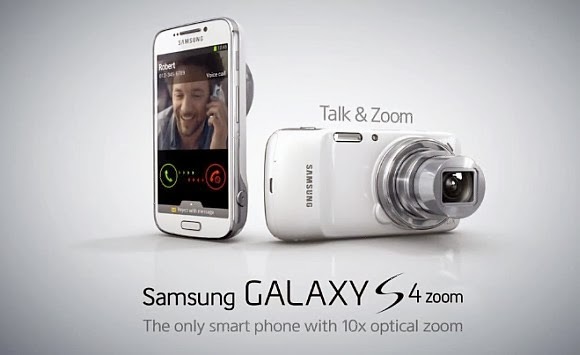 Samsung Galaxy S4 Zoom has 16 Mega-Pixel auto focus rear camera which has capability to take pictures even from far away through 10 x optimal Zoom. Make the most of every journey with location-based suggestions and it have Smart Mode Suggest. Camera: 16 Mega-Pixel rear camera with autofocus, Xenon flash, 1/2.33'' sensor size, 10x optical zoom (24-240mm), geo-tagging, touch focus, face and smile detection, HDR, panorama, image stabilization, Video and 1.9 Mega-Pixel Front Camera.